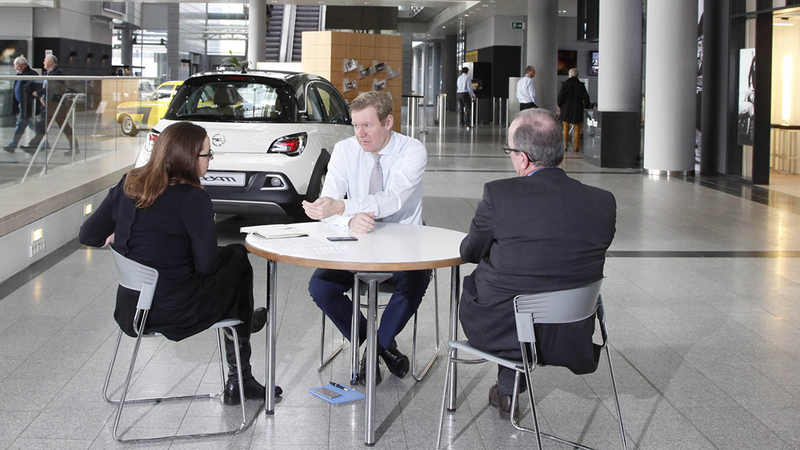 Where the customer is: For the Opel Post interview we met Carsten Wreth, new Vice President of Customer Experience, at the Opel Store inside Adam Opel House. employees as our most important customers, and his first car – a Kadett D with a individual sound sytem. 1. Mr. Wreth, I would like to know how you would describe a positive customer experience. Simply put, what makes a customer’s experience a positive one is when his or her expectations are met. I myself firmly believe that most of our customers are very realistic in terms of what they expect coming in. There should however be one or two instances where their expectations are exceeded, when they are pleasantly surprised. That’s what is needed to ensure that the customer is satisfied with the experience. “And which piece is most wanted by the customers?” Gina Harmening shows Carsten Wreth an embroidered polo shirt from the Opel Motorsport Collection. 2. Is it no longer enough to ‘wow’ consumers just by offering them a great car? Expectations have changed over time. Every brand offers a high level of functionality. This means positive customer experiences have to do with much more than just the product itself. It begins with how the brand is positioned, no matter where that may be. Surely, dealers play a major role here. What can I expect to find at the dealership when I stop by the first time? A row of cars with not a salesman in sight? Or am I greeted by staff ready to serve me? Yes, that I have indeed. I am actually just now in the process of buying an Opel for my wife and me. I visited dealerships in various towns and have to say that the level of service they offer varies from location to location. At the first dealer all that I awaited me was a row of cars parked side by side at an angle to each other. After a bit of searching, I was able to spot a few salespeople, but they were busy with other customers. After fifteen minutes, I drove off the lot without anyone coming to see if they could be of any assistance to me. Inaugural interview in Adam Opel House: The position of Vice President of Customer Experience Europe has been newly created to make the company more customer-focused. What I meant to say is that it’s great to hear that I’m coming into a situation where I can really affect change. Let me explain. I come from the telecommunications sector where everything is much more customer-centric. Companies know a lot more about their customers and use this information to present them with new service packages tailored to meet their needs before they even come to them asking for it and before their contract is up. A strategy like this should work in the automotive sector as well. What do we do in the six to eight weeks after the customer has placed his order and is sitting at home waiting for his new car to arrive? Absolutely nothing. 6. And what could we be doing in this time? We could notify customers that their car is set to go into production today. Or that the vehicle is now at station A and will then be moving on to station B where component C will be installed. We could also send them actual photos. That’s definitely within the realm of what’s technically possible at present. All this heightens the customer’s anticipation for the arrival of their new Opel and makes for an exciting experience in my eyes. 7. How good is our service app? Apps like MyOpel are great. They provide customers with all they need to know about their vehicle. There you can find user manuals or schedule a service appointment. The only group of users not overly enthusiastic about apps is older buyers. That being said, they are keen Internet users, reflecting a general society-wide trend. This all means we have to continue efforts to further develop both platforms, i.e., the website and the app. OnStar indeed represents a chance to enter a new era in customer relations. It offers functions that go far beyond those the dealer has to offer. In the past, customers would come in for servicing at the appointed time and learn then and there what work needed to be done. This often meant unpleasant surprises. With OnStar that’s a thing of the past. They now receive up-to-the-minute status updates on their vehicle, meaning no surprises as they already know what to expect before they head in to the dealership. 9. Are customers willing to pay extra for a service like this? At the beginning of this year Carsten Wreth moved from the telecommunications industry to Opel. 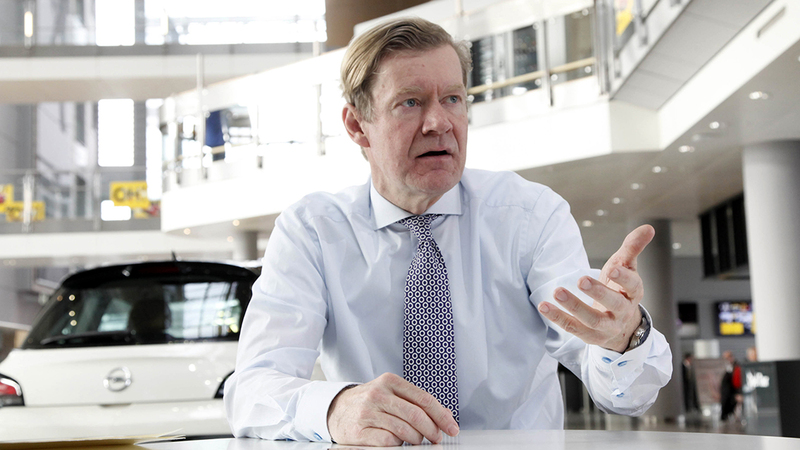 He will report to Peter Küspert, Vice President Sales & After Sales, Opel Group. Exactly. If the car breaks down, or the customer is involved in an accident or experiences some other problem, we can pinpoint their location, contact them, and tell them to remain calm, that we will take care of everything. 11. 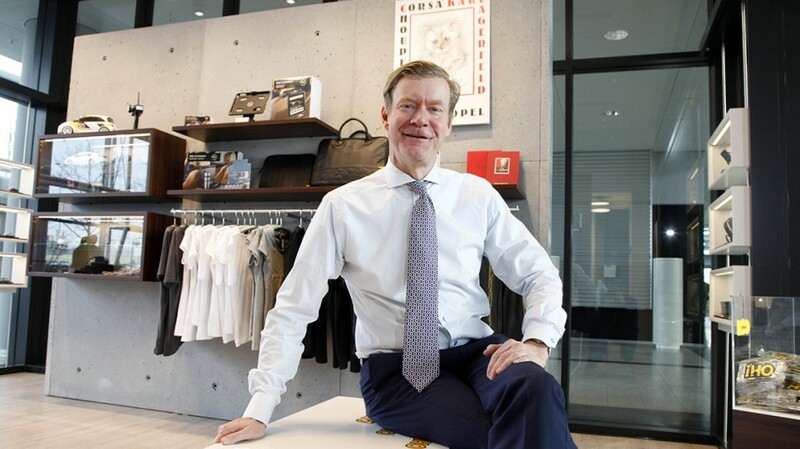 Götz Werner, founder of the German pharmacy chain dm, put it this way: Employees are the most important customers. If you cannot get them to understand the corporate philosophy, the customer never will either. Is there any truth to this? I fully agree with what he is trying to say here. Employees are more loyal yet also more critical than any customer could ever be. They likewise have higher expectations regarding our products. If we are unable to get our employees to stand behind our brand values, this is a major failure on our part. That’s because employees are among the group of customers whom I am seeking to actively engage with next. Others include tradition consumers, fleet customers, and dealers. We will also be taking a closer look at the sales processes for employees. 12. Have you identified other areas where action is needed? I believe we budget in too little time for customer testing when drawing up the project timetables. It’s often little things that we can improve at little extra cost. Let me give you an example: When using the navigation system, why are the buttons to confirm or cancel an action located at different locations on different screens? Carsten Wreth has 15 years of experience to put the customer at the center of corporate thinking. I will be in charge of overseeing the call centers in the future. I’m very glad the decision was already made to bring the call centers in-house before I joined Opel. They are a key prong in our new customer experience strategy. It is our goal to get more involved in the daily management oft he Call Centre activities to ensure a high level of quality at this important customer contact point. 14. What does it mean for you to work for Opel now? I come from the telecommunications industry. The product you deal with there is just a small SIM card. It’s quite difficulte to place it on the market. Since the task is to get the customers to build an emotional bond with such a tiny piece of plastic. Hence I enjoy being here and working with products that you can touch. And it’s not just about touching. 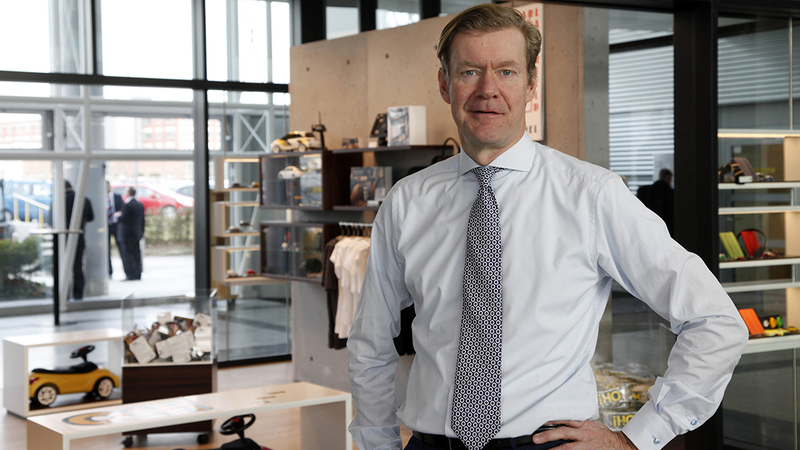 Recently I was out on business with Chief Designer Mark Adams, and I have learned: Opel – those are products you live and breathe. It was a mint green Kadett D. It had a 1.4-liter, 60 HP engine. I was born and raised in Hamburg, and when stationed in Kiel doing military service in the German Navy, I needed a car. It was a stripped-down model; it didn’t even have a luggage compartment cover. I had to do a little improvising and use plywood to mount the stereo speakers at locations where I could get good sound out of them. Carsten Wreth has held the newly created position of Vice President Customer Experience Europe since the beginning of the year. In this capacity, he aims to help position the company in a more customer-oriented manner. 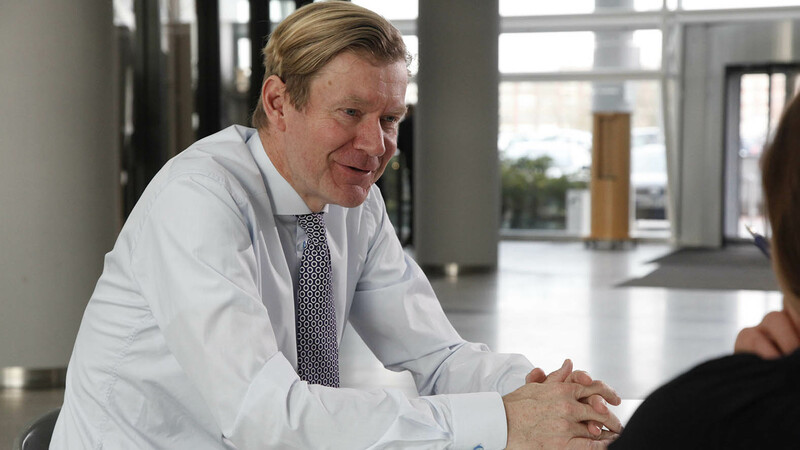 Working in the telecommunications industry allowed Carsten Wreth to gain extensive experience in this sector, most recently at Telefónica Global Services, where he served as Chief Information Officer (CIO), Managing Director, and Head of Customer Service. Carsten Wreth was born and raised in Hamburg. The 49-year old studied business administration and mechanical engineering in Kaiserslautern.